Is Chocolate Good or Bad for IBS? In the past, prevailing wisdom always held that chocolate is a GI irritant and therefore should be avoided by people who have IBS. If you love chocolate, as many people do, this may just break your heart. However, perhaps all is not lost. The new science that shines some light on the subject may allow you to indulge in this so-called "food of the gods." Now for the good news for IBS! Recent research suggests that cocoa may serve as a prebiotic—a food that encourages a healthy balance of gut bacteria. According to researchers, very little of cocoa flavanols get absorbed at the level of the small intestine and therefore they make their way into the large intestine. Once there they interact with bacteria in your gut. A small study found that daily consumption of a drink high in cocoa flavanols over the course of a four-week period resulted in changes in the gut bacteria of study participants. Both bifidobacteria and lactobacillus microbes were increased—both types of bacteria thought to be beneficial for the gut and overall health. These benefits include inhibiting the growth of disease-causing bacteria and preventing such disease-causing bacteria from growing on the intestinal lining. The study results also indicated that clostridia microbes, an example of a potentially disease-causing bacteria, levels were decreased. The authors note that most of the more common types of prebiotics, e.g. the fructooligosaccharides and galactooligosaccharides, do not typically increase levels of lactobacillus microbes. Since both prebiotics are both considered to be high in FODMAPs, this new information makes cocoa a potentially nice prebiotic option for people who have IBS, who find that their symptoms are worsened by eating these particular FODMAP types. 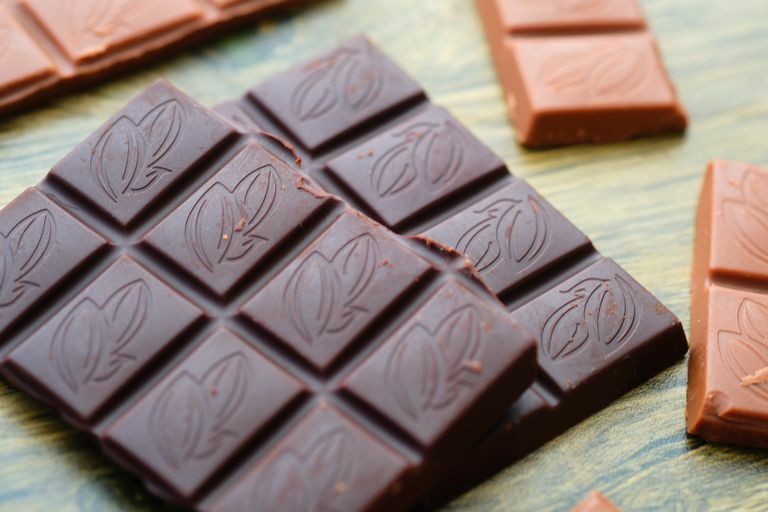 Dark chocolate: Half an ounce to no more than three ounces in a serving is considered to be low-FODMAPs. Milk chocolate and white chocolate: A half ounce serving is considered low-FODMAP. At one ounce, the level of lactose increases to the point that it might cause you to have symptoms if you are lactose intolerant. Cocoa Powder: Two to four heaping teaspoons are considered low in FODMAPs. Drinking Chocolate (23% - 60% cocoa): Serving sizes less than three ounces are considered low in FODMAPs. Note: Carob is considered high-FODMAPs due to its fructan content. Will Chocolate Cause You to Gain Weight? Here is a possible silver lining to your IBS. Limiting your chocolate intake due to its FODMAP content may help you to avoid the pitfall of eating too much chocolate. Most of the chocolate products that are readily available for purchase have high levels of sugar and fat, and therefore eating such products can contribute to weight gain. And of course, being overweight increases your risk of diabetes, heart disease, and dementia. Thus, eating high-calorie chocolate products will negate any potential benefits that you might get from the flavanols from the cocoa itself. Here is what you need to know: the higher the percentage of cocoa in a chocolate product, generally the healthier it is for you. This is because you are getting more of the healthy cocoa, with less of the unhealthy sugar and fat. The darker the chocolate, the higher the percentage of cocoa in the product. You may need to wean yourself up to higher cocoa levels. In other words, start out with a dark chocolate that is rated as being 70% cocoa and then work your way up to 85%. You will find that as you move away from milk chocolate to the higher levels dark chocolates, that the taste becomes less sweet and slightly more bitter. Believe it or not, this is a good thing! It is harder to eat too much of something that is slightly bitter. Thus, with a darker chocolate, you may find that you are satisfied with just eating a small portion. So, yes you can have your chocolate and feel good about it, too. Another healthy way to consume chocolate is to add raw cacao to smoothies. Raw cacao offers you all of the full benefits of cocoa beans without the downside that comes from the added sugar and milk fats found in chocolate. Raw cacao can make your smoothies taste decadent and delicious. Limit your serving to the two to four heaping teaspoons recommended by the Monash researchers, and enjoy. Brickman, A., et.al. "Enhancing dentate gyrus function with dietary flavanols improves cognition in older adults." Nature Neuroscience 2014 17:1798-1803. Corti, R., et.al. "Cocoa and Cardiovascular Health" Circulation 2009 119:1433-1441.